Compared to most celebrity chefs and cooks we see on TV, Delia Smith comes across like a domestic science teacher. But ask anyone who’s tried her recipes and they all say the same thing, Delia’s recipes are easy to follow and they always work. And while she may not cut the mustard with the pukka patter, no one else even comes close at teaching people the foundations of cooking from the basics up. 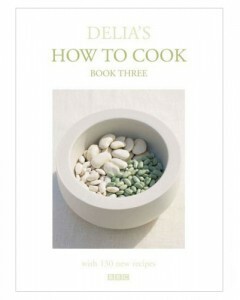 Delia’s How to Cook is a simple-to-follow cookery course, written for people of all ages and abilities. It’s real back-to-basics techniques using staple ingredients to produce the best of British cookery. 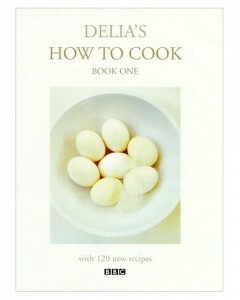 Delia’s How to Cook Book One is aimed at absolute beginners: people whose idea of cooking is heating up a ready meal. But it also contains useful information for accomplished cooks. It’ll equip readers with some important, fundamental cooking techniques and before long they’ll be cooking up some really tasty home-made food. Delia’s recipes have very detailed instructions, and readers are taught how to work with the staples: eggs, flour, rice, bread and pasta. But the book is about a bit more than just boiled eggs and baked spuds. It’ll inspire you to make moussaka with roasted aubergines and ricotta, wild mushroom tartlets with poached quails’ egg and apricot galettes with amaretto. The recipes are accompanied by beautiful photographs; many have several extra photographs which show the dish at various stages of preparation. This can be handy when the recipe includes gravy which needs to be ‘thickened’ or if potatoes need to be cut into ‘chunks’. Perfect sponge cakes, fail-safe pastry and Delia’s guide to the Great British Breakfast are all there, along with an everlasting soufflé and tempura prawns. For the health conscious there are chips that you don’t have to fry and Delia’s amazing no-fat white sauce. 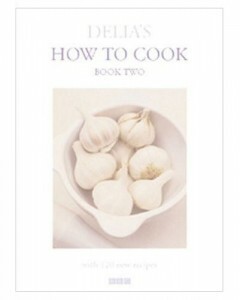 Delia’s How to Cook Book Two continues the theme. Delia demystifies cooking so it becomes easy to attempt both simple and more advanced dishes. For those who have mastered the techniques, and for those who are already accomplished cooks, How to Cook Book Two contains a collection of 120 new recipes from Roast Lamb in a Shrewsbury Sauce to Fresh Pecan and Almond Crumble and Classic Crème Caramel. The book features sections on The Store Cupboard, Fish, Meat, Poultry, Vegetables, Salads, Dairy Produce, Fruit, Cheese and Chocolate. Delia’s How to Cook Book Three takes the reader through the techniques of pickling and preserving, how to equip their kitchen from scratch, and how to get the most out of food processors, bread machines and ice-cream makers. The recipe chapters explore some wonderful classics like Old English Apple Hat and Smoked Collar of Bacon with Pease Pudding to exciting new flavours such as Teriyaki Grilled Marinated Salmon and Sea Bass with Puy Lentil Salsa. Delia investigates the cooking of pulses, from adzuki beans to pintos by way of many more familiar ones, preserves, patés and starters, while including less familiar flavours from the Far East. As the three books cover different stages of a complete course, it’s a good idea to collect all three volumes and work your way through them in order.